HEARD is a private communication platform that takes an open approach to engaging families at school: facilitating transparency, ensuring equal access, and bridging student learning across school and home. HEARD enables two-way communication not only between families and teachers, but among parents. It provides all members democratic access to features — no hierarchy of controls. And it provides easy ways for teachers to share class insights and help families support their child’s learning at home. The result? Nearly 100% of messages sent every week are positive. More than 80% of members contribute month over month. Posts on HEARD have a read rate of 70%. Engaging families is critical to school communication, and HEARD is built upon enabling and encouraging parent voice for the benefit of all — teachers, admins, parents, and students. Parents are a child’s first and life-long teachers, and family involvement in their child’s education at school is one of the most accurate predictors of student achievement (Natl. PTA, 2000). Regardless of family income or background, students whose parents are involved in their schooling are more likely to attend school regularly, do better in school, and enjoy school more (Mapp, 2002). But despite the positive impact parents have on student success, family engagement is one of the most neglected supports for children’s learning at school (Weiss, 2009). In fact, a 2008 monitoring report found that family engagement was the weakest area of compliance by states (U.S. Dept. of Ed). Most parents believe they can make a difference in their child’s learning and yearn to be more involved at school, but schools often fail to inform parents on what their children are learning, how they are performing, and how parents can help them do better (Public Agenda, 2011). > Only 4 out of 10 families report receiving a phone call from school about their child over the preceding year (Noel, 2016). > 60% of secondary parents feel their child’s teacher did not adequately inform them about classroom happenings and requirements (NSPRA, 2011). > Only 22% of parents could name a basic milestone that their child should have learned in the past year (Public Agenda, 2011). When it comes to parents’ satisfaction with their child’s school, family engagement is the biggest driver of overall satisfaction. Yet only one-third of parents feel very satisfied with family engagement at school (Mattal, 2017). Engaging Black and Hispanic families is even more critical as a student’s race and immigrant status have been shown to be factors in whether or not teachers contact their parents. Math teachers are more likely to contact parents of Black and Latino youth about disruptive behavior than parents of White youth; math and English teachers are less likely to contact immigrant Asian parents about academic and behavioral concerns, even when students are struggling; and teachers are less likely to contact minority parents with news of accomplishments (Anderson, 2016). Yet, 75% of Black and 67% of Hispanic parents say a parent can never be too involved in a child’s education. About half (47%) of White parents agree (Pew, 2015). Parents are not alone. K-12 teachers cite a lack of parent involvement in the classroom as a top three source of frustration and nearly all want parents to get involved in their classroom by “communicating regularly” with them (Univ. of Phoenix, 2014). The teacher-parent partnership is key to family engagement, which positively impacts student achievement. A University of Chicago study following 400 schools found significant academic gains by students in schools that prioritized relationship building between families and teachers, compared with schools that didn’t. Project Appleseed highlights ineffective school communication, insufficient teacher training, and a lack of trust between teachers and parents as barriers. In a 2012 survey by NEA, 68 percent of teachers reported difficulty in dealing with parents while 63 percent of parents reported never having difficulty with teachers. But one-quarter of parents stated their biggest challenge has been teachers’ perceived lack of understanding for their concerns, while one in three teachers cited parents’ lack of understanding of their child’s issues as their biggest challenge. Instead of promoting equal partnerships at a systemic level, many family engagement initiatives default to simply one-way communication (SEDL, 2013). Can Technology Play a Role in Family Engagement? It takes both teacher and administrator time to keep parents informed. Similarly, parents juggle work, family organization, and communication commitments to their children’s schools. Technology is increasingly being used to facilitate the regular communication that teachers want with families. Recent studies show technology can also make a difference in relationship building and student learning outcomes. 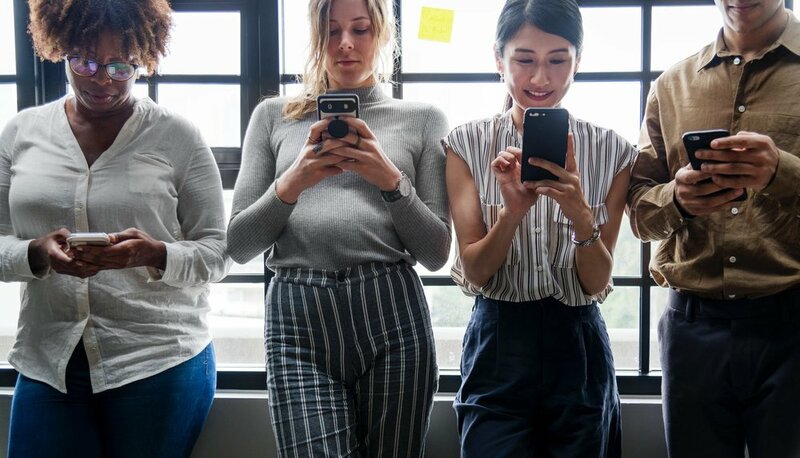 Text messaging centered on educational goals between parents and teachers was shown to boost student academic outcomes – i.e., GPA and tests scores (Wood, 2017). One study showed students get more homework done when parents and teachers emailed each other (Kraft, 2014). Most studies on technology-mediated communication are limited to email or text communication. As technology plays a more pervasive role in family-teacher communication, the need to determine the most effective and inclusive way for teachers to engage families using digital forms of communication will be critical. 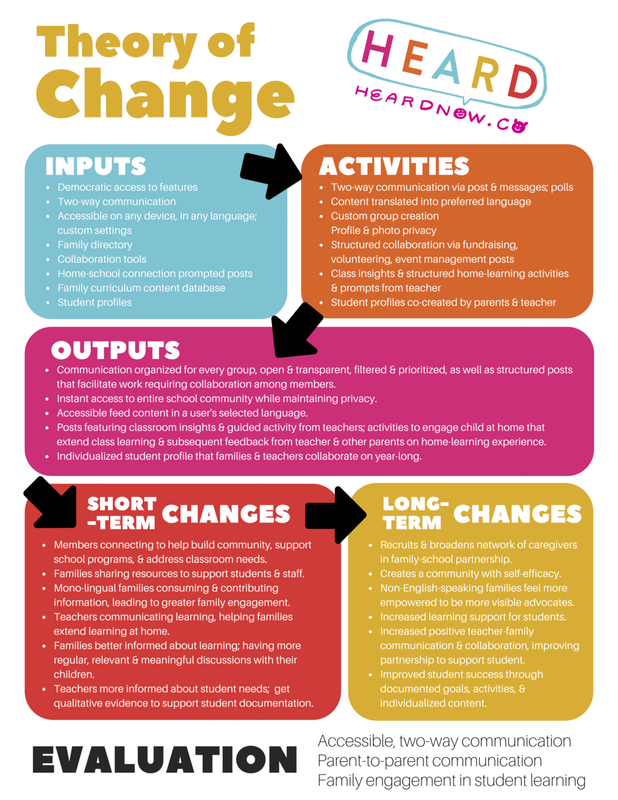 HEARD is designed around a theory of change that 1) enabling two-way communication between teachers and families, 2) enabling communication among families, and 3) facilitating family engagement in student learning will build trust, collaboration and self-efficacy that improves parent-teacher partnerships around student learning — ultimately increasing student success in school communities. Schools use a variety of different channels to communicate with and organize families. Taken together, these channels create an unmanageable volume of communication for teachers and families, making it hard to filter what’s important and engage effectively. HEARD is a private social network that consolidates many of these channels into one multi-purpose hub. 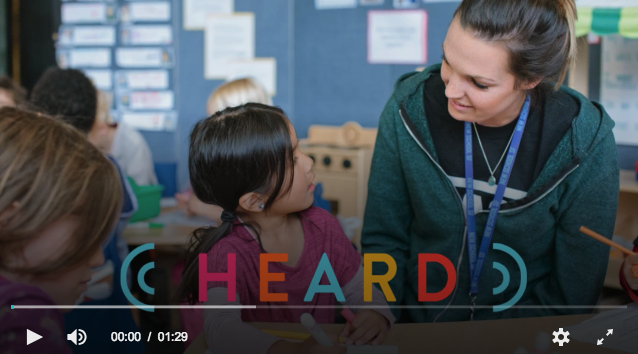 Accessible on any device and in any language, HEARD enables a school community to connect, communication, collaborate, and make home-school connections in a way that’s easy, effective and inclusive. HEARD enables teachers to give parents a regular window into the day’s learning. More and more surveys point to parents’ desire to get more information on curriculum and what is being taught. Long newsletters capturing what happened a week ago aren’t as helpful as daily bite-size glimpses of current class activity. These snapshots of learning are not only easier for teachers to share, but provide more regular and relevant opportunities for parents to engage their child beyond “how was school today?” Families are better informed and can help support teachers and their child. A December 2017 feedback survey of teachers on HEARD showed that 100 percent of teachers surveyed said they would recommend HEARD to a fellow educator and 83% said HEARD met their needs “very well” or “extremely well.” Teachers agreed HEARD enables parent engagement (89%), is an effective tool in communicating with parents (83%), and supports home-school connections (78%). A focus group with Spanish-speaking families showed that families like seeing what’s happening in class via HEARD and want more communication about learning concepts and how to support children at home. Another family focus group revealed that getting updates from the class and shared articles from other parents was the most useful aspect of HEARD and the level of detail teachers used when posting about class learning was the most liked aspect of HEARD. For schools wanting to engage families, this can take various forms -- from creating better communication with families, creating a more welcoming school culture, hosting community events, inviting parents into policy decisions. Some family engagement strategies often involve providing lists of items and activities for teachers to use to reach out to families and for families to do with their children. While this information dissemination strategy gives staff and families skills and tools, teachers and parents also need the opportunity to practice what they learn and receive feedback and coaching from each other, peers, and facilitators. Some schools and teachers get the help of family engagement organizations -- like Families in Schools. These organizations provide teacher training, support teachers in facilitating in-person home visits, and in-person parent education. They also help to further the research and belief that a student’s learning should be a partnership between schools and families. The U.S. Department of Education and Dr. Karen Mapp’s dual-capacity building framework for family-school partnerships has become one of central tools for conceptualizing the work of the family engagement movement. "Many people think that adolescence is a time for parents to back away, that kids are pressing to be more autonomous. But it's actually the opposite. It’s the role of teachers and parents to help youth make connections between what they’re learning in school, what’s happening in the real world, and what that means in terms for their own interests and talents and goals."